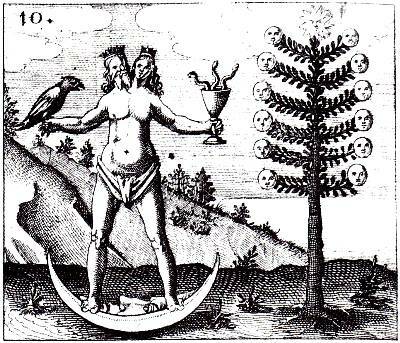 Drawing again from de Rola’s anthology (see earlier post), seven emblems by Balthazar (Baltzer Schwan) from Johann Daniel Mylius‘s 1622 Philosophia reformata. 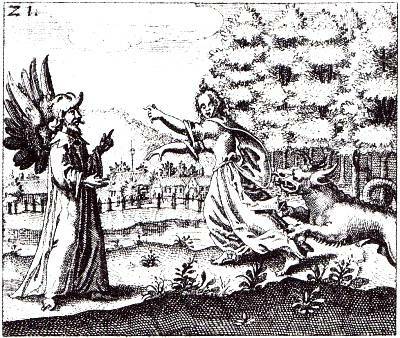 These engravings illustrate application of the alchemical formula Solve et Coagula — ‘Dissolve the Fixed and Coagulate the Volatile’ — towards the ultimate conjunction of those opposing principles: the Philosopher’s Stone. The descriptions below are de Rola’s. “Without help from the Volatile, the Fixed is never sublimated; and conversely, the Volatile in growing Fixed grows more and more resistant to the tyranny of the external Fire” (p180). “Every fixation of the Volatile (the fleeing maiden caught by the monster) is followed by a volatilization of the Fixed until Perfection is reached” (p180). “The First Silver Perfection is reached at the end of the Putrefaction” (p181). 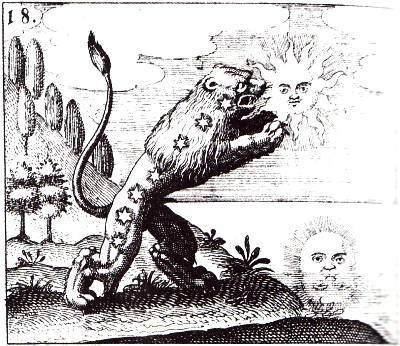 “Here is the Universal Dissolvent, the Green Lion or Mercury of the Wise, without which nothing can be achieved” (p181). 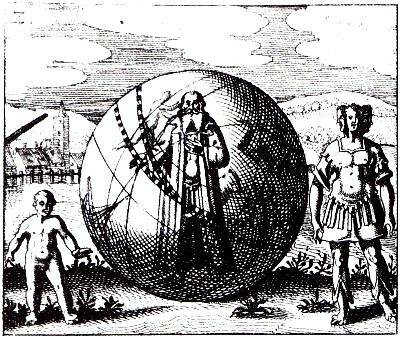 “Three faces of the Stone: the Philosophick Child, the purified Matter; the Old Man in the sphere, the Materia Prima; and the union of the three Principles, Mercury, Sulphur and Salt” (p182). 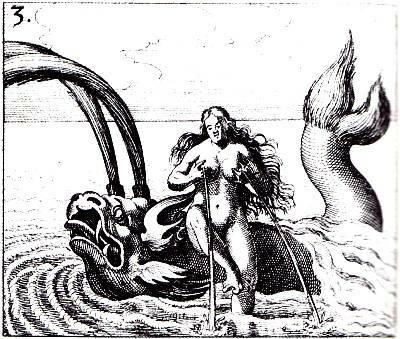 “This emblem (equivalent in significance to the image of a Mermaid or Siren) shows the union of Sulphur (our Fish) and of the first Mercury (the Woman), from which results Philosophick Mercury” (p182). “Here are the components of the Secret Fire: the fiery Water and the watery Fire which, excited by the ordinary Elemental Fire, cause the Birds to fly” (p182). Sulphur, Mercury & Salt: the Tria Prima. 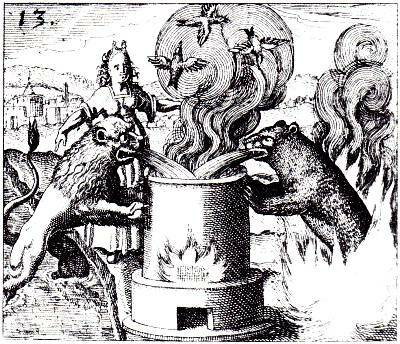 Such is the Grand Triad of Western Alchemy. Perfectly mirrored by its chinese analogue: Shen, Qi, Jing, or San Bao (Three Treasures). 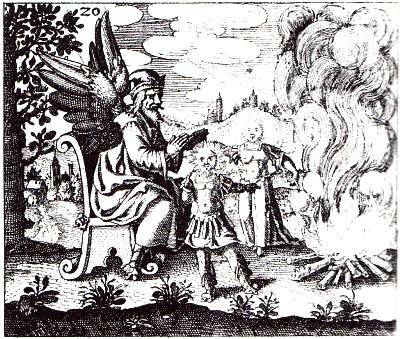 Three medicines to make the Stone of the Philosophers. The three are indeed one: different degrees of the ubiquitous Mercury (Qi), a vapor (fiery Water and the watery Fire) that circulates everywhere.